The Zaha Lounge Chair has the right balance of sophistication and relaxed style. It’s modern, yet fun and inviting. The striking dark charcoal color is sharp and on point. The frame is made with powder coated aluminum and it has been beautifully wrapped with high tech rope, and topped with Sunbrella® cushions for extra comfort. W 28.7 x D 29 x H 31.5 in. Contributing to a feeling of cool, calm and collected is all you want from a relaxing chair… May we present to you the stunning stylings of the Zaha, a fantastic example of sophisticated tranquillity?. The Zaha Relaxing Chair is part of the Zaha family, which includes a fabulous Dining Chair. The style lends itself to a mix of mid-century fashion with the precision and stateliness of Scandinavian furniture that is so on trend! A light and airy aluminum base is moulded into a sleigh style, which supports and complements the rounded nest-like chair, which, with diamond patterned wicker and soft Sunbrella® cushioning, is a haven of peace and relaxation! Place two of the gorgeous Zaha Relaxing Chairs poolside for ultimate unwinding after a long day and a swim in the water! Make sure you look at one of our simple, stylish accent tables to complement this terrific look and feel. Perhaps you’ve set up your dining area with the matching Zaha Dining Chairs? Why not create a relaxing nook for you and your guests after your large lunch by setting up 6 of these tremendous Zaha Outdoor Relaxing Chairs in situ alongside with a low lying round coffee table for after coffees and dessert! The options are endless with this impossibly stylish piece! 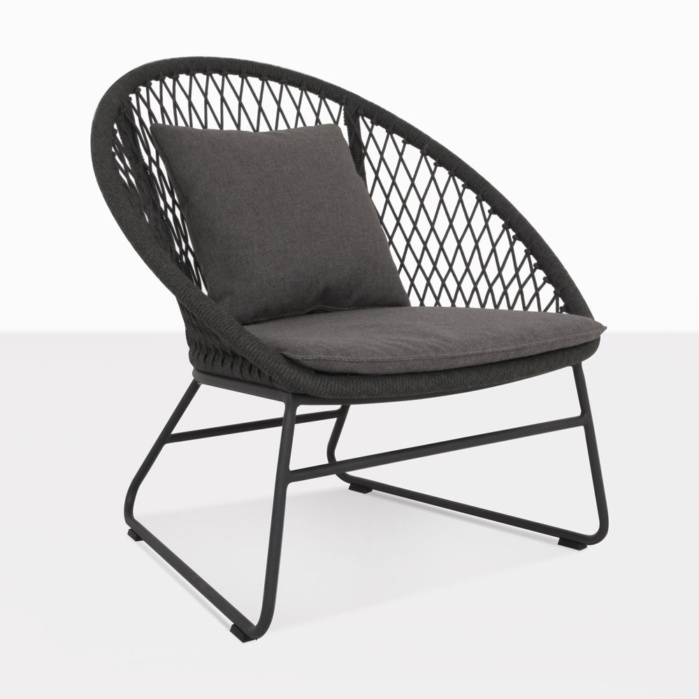 The Zaha Wicker Relaxing Chair is made from incredible materials that give prestige and comfort to any setting, and are of the highest quality, so you know this chair will keep you in luxury for years to come! Beginning with the powder coated aluminum frame, which assists the piece in avoiding any type of corrosion. This is then brilliantly wrapped with outdoor wicker, which through-dyed and UV treated is strong and robust. Finally, your cushions are made from high quality Sunbrella® material which aids to your comfort and can stay outside through the changing seasons! The Zaha Relaxing Chair is an example of style and sophistication. Buy yours today!